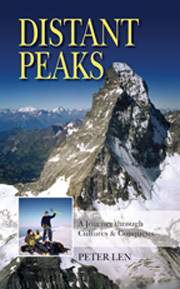 Written through the eyes of an amateur climber, Distant Peaks describes Mr. Len's motivations for attempting these mountains and portrays the challenges of dealing with the physical and mental aspects of climbing, especially at higher altitudes. Not limited to just describing the individual climbs, Mr. Len also relays his thoughts on the unique cultures and spectacular mountain ranges that he encounters along the way. A light-hearted depiction of climbing adventure, Distant Peaks is an enjoyable read for any outdoor enthusiast. "Reading Peter Len's book, I felt like I was peering into the mind of my clients. Needless to say, the experience was instructive for a guide who has led over 120 expeditions. Peter captured the power of the expedition experience: from a climber's pre-trip anxiety and expectations, to the unique settings he's explored and even the interplay of personalities he's tied in with. Peter's humble approach to climbing and writing results in a book that many new climbers and jaded old timers will appreciate." 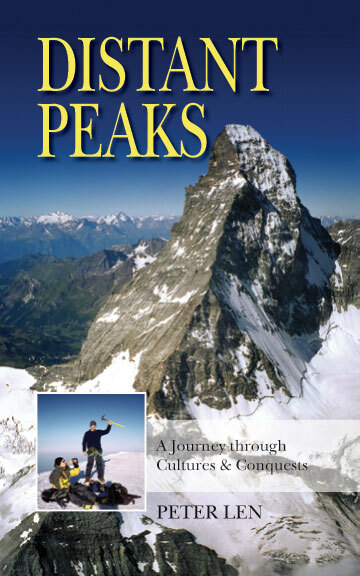 "Peter Len, through detail-rich prose and a profound love of the mountains, takes us on a journey up the world's landmark peaks. This is not the rarified realm of super-alpinists like Messner, House, Garibotti, and Prezelj, but rather an everyman's voyage up the guided trade routes about which the bulk of all climbers know and dream -- the Exum Ridge of the Grand Teton, for example, or the Hörnli Ridge of the Matterhorn. If you're training ... for that next dream climb, Distant Peaks, with its honest, enthusiastic look at guided ascent, ... is indispensable." "For anyone who has wondered what it is like to climb some of the classic mountains of the world, Distant Peaks tells the entertaining story of one man's experience doing just that. It is one of the few books I have read that capture the unembellished realism of a self-proclaimed amateur climber going through the process of becoming an experienced alpinist. I'm sure Peter Len's stories of travel and adventure in foreign countries will inspire some armchair mountaineers to get out and try it themselves." The following are links to reviews of the book as well as other references to the book. This list contains all known references, good or bad. If you know of a site not listed here, please contact me. Note: Visit the book's page on Amazon to see their "Look Inside" capability. This gives you the ability to search inside the book or get random pages. Please feel free to email me with any questions, comments, reviews of the book, or similar climbing stories. I can be contacted by email at peterlen@distantpeaksclimbing.com.